Last summer, our neighbor (and good friend) came to us and asked if we could drill holes in an old Coca-Cola crate to make a dog bowl holder for her 5 month old yorkie. She was hoping this would solve the problem of him picking up his bowl and running around the house with it once he was finished! Our neighbor just wanted us to flip the crate over and drill holes. If we did this, the Coca-Cola writing would be upside down. Mr. Woodsy decided to take it to the next level without our neighbor knowing! 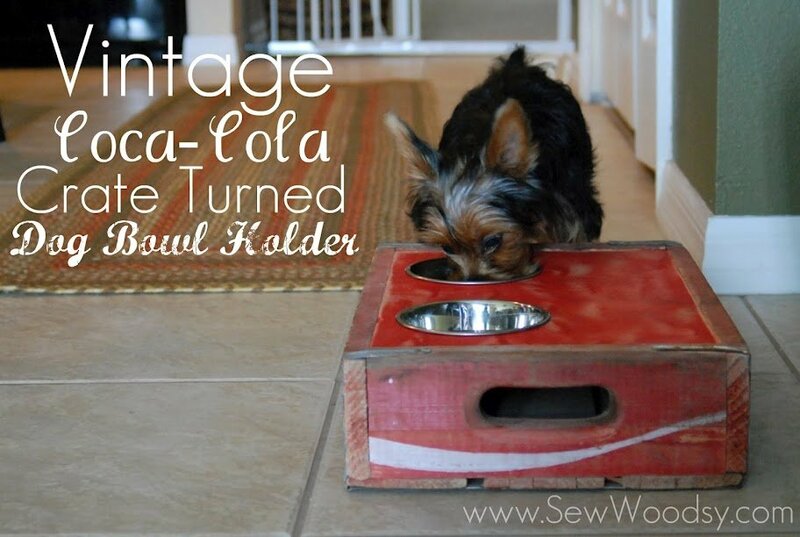 This vintage Coca-Cola crate turned dog bowl holder was made within 30 minutes. Follow our step-by-step tutorial to make your own. *This post was previously published over at Pretty Handy Girl. 1. Cut the 3/4 inch piece of plywood to the size of the vintage coca cola crate opening. Our crate opening was 14 inches by 10 inches. 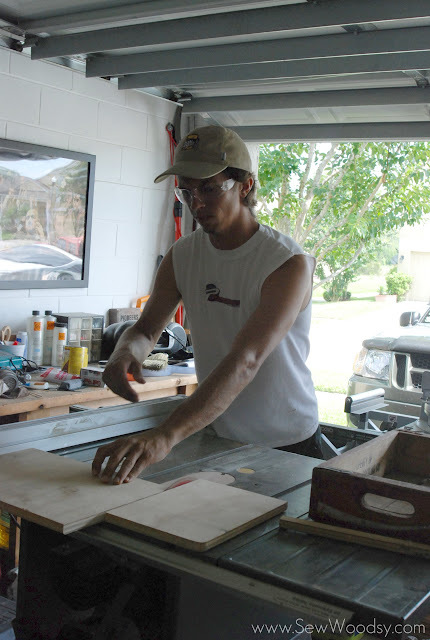 *I like to check that my blade is square with my fence on my table saw. 2. After his first cut he checked the size of the piece of plywood to make sure it fit in the crate. You will want your piece of wood to fit in the crate snug. *At this point he trimmed up the piece of wood to create the snug fit. 3. Measure the diameter of the dog bowl. *For this tutorial to work for you your dog bowl you will need to have a slight lip on the edge for it to rest on top of the wood. 4. 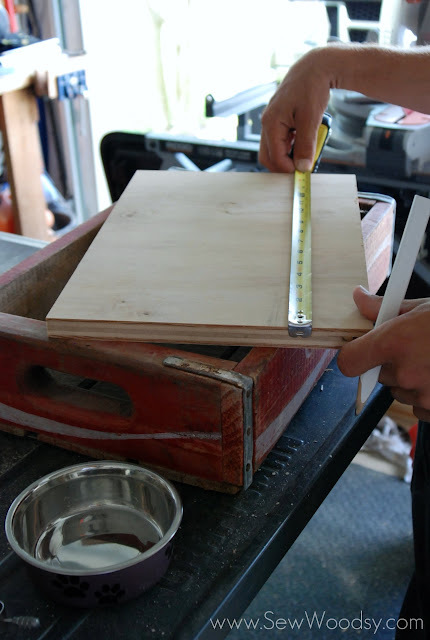 Now that we know what the diameter is of the bowl, measure for placement on the plywood. *Because this is for a small dog we didn’t want to center the bowls. We wanted to ensure he would be able to eat from the bowls. 5. Now divide the diameter of the dog bowl in half to get the radius. In this case, the dog bowl was 5 inches across. We had a 2.5 inch radius. 6. Using a tape measure, set the placement for the two bowls lengthwise so that they are evenly spaced out. 7. Using a compass begin drawing the circles for your two dog bowls. *This is what your piece of plywood should look like after you done drawing your circles. 8. 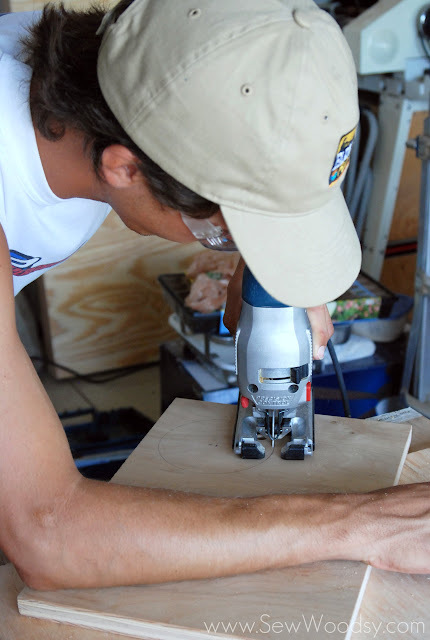 Next, you’ll want to drill a small hole large enough to fit the blade of a jigsaw in the wood. *We used a half-inch fostner bit. *This is what my piece of plywood looked like after I drilled the two holes in the board. 9. Using a jigsaw: carefully cut out the first circle. *Make sure you cut along the inside of your markings so that your dog bowl doesn’t slip through. *We double checked to make sure the dog bowl would fit in the hole snug after it was cut. 10. Using a piece of sandpaper, sand down the edges and clean up the inside of the hole so that the dog bowl fits better! *Then, double check again to make sure that the placement of the hole would be acceptable distance for the dog to reach the food bowl. *You’ll also want to double check that the dog bowl doesn’t bottom out on the crate. 11. Next up, grab a can of spray paint, and begin lightly spray painting the piece of cut-out plywood. 12. Grab the orbital sander and give it a light sanding to distress the red spray painted surface.You’ll want it to match the vintage crate as best as possible. Your vintage Coca Cola crate turned dog bowl holder is almost complete! 13. Using a pneumatic nail gun (and air compressor) shoot a few nails along the sides of the crate to hold the plywood in place. 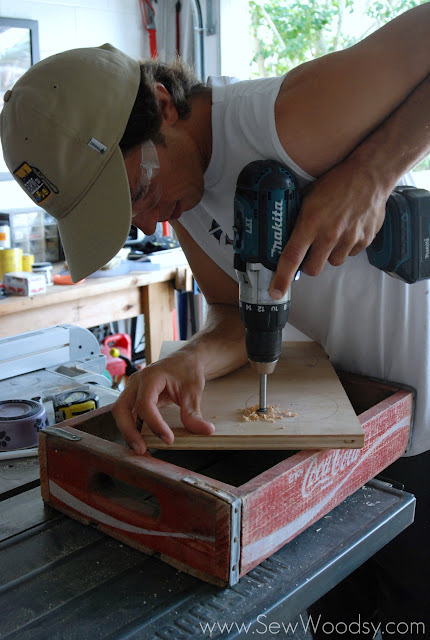 *If you don’t have a nail gun you can use finish nails and a hammer to secure the top piece of plywood. 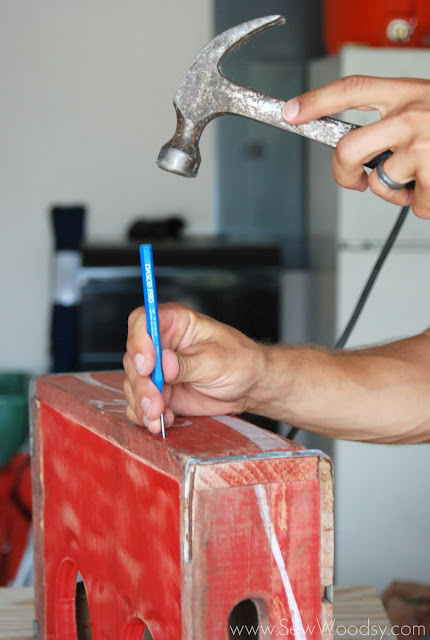 As pictured above, use a center punch so that you don’t destroy your crate when hammering the nails in . Let your pup test it out! And he has discovered multiple ways to now eat dinner! This is so unique, decorative and useful! Love it ~ and your little pooch is too cute! Katie, what a great idea! I’m passing this on to my friend, she loves Coca Cola & has a dog too. She’ll love this project! You guys rock! Oh I LOVE this! We have a great dane, so maybe I’d have to modify it to use a bigger crate so it’s higher up for him, but it’s a fantastic launching point. Pinning! Thanks Kelly! Yes, I’m sure you can make a larger version of this! I love this project, I will never look at a Coke crate the same! Awe thanks Jacque! Our neighbor is in love with it and the pup is much larger now since this was done last summer! This is an adorable idea and a great way to enjoy an old crate. Oh! This is so, so wonderful! If it weren’t past 8:00 p.m. I’d be in my car heading to the local antique mall to find a Coca Cola crate. I’ve never been satisfied with the selection of dog bowls at our local stores — nothing quite goes with our vintage home. Can’t wait to show this to my hubby! Jenn– glad we could inspire you to make your own! I hope you’ll share when you do! I love that! Now I’ll be on the lookout for another Coke crate! This is such a fun repurposing and a FANTASTIC tutorial! I’d love to get my hands on a few old crates…You may have inspired an impromptu treasure hunt! Awe glad you like it Matt! I would love to make one for our dog (since this was for our neighbor). I’ll have to keep my eyes peeled the next time we are out and about! What a great idea and it raises the bowls off the floor too. I guess we both had fun ideas for how to use these vintage Coca-Cola Crates! Thanks for stopping by my blog. This is so cute! Love the idea! It looks great! What a great project! This makes for a solid, stable and retro solution. I can just see using 2 stacked crates for larger dogs if the “middle” is also cut out for their deeper bowls. Pinning this today for our fans! Thanks Chris! I love that idea for larger dogs.